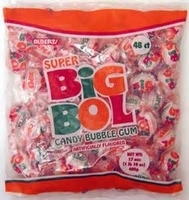 Super Big bol gum is a candy coated bubble gum. You get candy and bubble gum all in one sweet treat now with 20% more gum filling. This in an old time gum and at one time you were able to get it at every corner candy store. Now it is a little harder to find.